Webcam Buja: Traffic A23 - KM 42,0 - Gemona itinere nord - A view of the current traffic situation. Osoppo: Traffic A23 - KM 47,0 - Gemona itinere sud, 2.9 mi. Mels: Traffic A23 - KM 37,0 - Ledra Ovest itinere sud, 2.9 mi. Gemona del Friuli: City Panorama, 3.3 mi. Tricesimo: Traffic A23 - KM 31,0 - Udine Nord itinere sud, 6.4 mi. Alesso: Traffic A23 - KM 54,3 - Carnia itinere nord, 7 mi. Somplago: Traffic A23 - KM 56,1 - Viadotto Somplago itinere nord, 7.8 mi. Tavagnacco: Traffic A23 - KM 25,2 - Udine Nord itinere nord, 9.7 mi. Amaro: Traffic A23 - KM 61,0 - Carnia itinere sud, 10.1 mi. 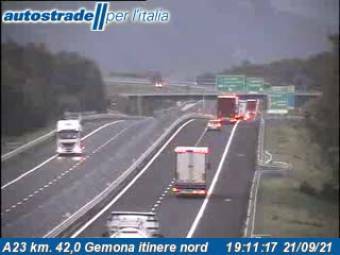 This webcam Buja with the theme Traffic was added on January 21, 2014 and is operated by Autostrade per l'Italia. It got 589 visitors since then. Shouldn't this webcam work or should the link be wrong please report that here. You can add this webcam here to myCams.